An ENDO 2018 presentation that linked essential oils to gynecomastia in prepubertal boys caused a bit of an uproar in the spring. The study authors detail what their research means, why certain populations should be mindful of essential oil use, and the importance of future studies. New research shows that some components of essential oils, deemed safe and found in a variety of products people use every day, may be endocrine disruptors that cause prepubertal gynecomastia in young boys. Industry and other interested parties have pushed back on the findings, but the researchers are confident in their data. The current study shows a link between essential oils and enlarged breast tissue in prepubescent boys, and the condition resolves once the boys stop using the products. A study presented this past March at ENDO 2018 in Chicago raised yet another concern in the growing problem of endocrine-disrupting chemicals (EDCs), providing further evidence of a suspected link between prepubertal gynecomastia and regular exposure to lavender or tea tree oil. According to researchers, key chemicals in these common plant-derived oils act as EDCs, which may cause prepubescent boys to develop enlarged breast tissue. Lavender (LO) and tea tree oil (TTO) are among the so-called “essential oils” that have become popular in the United States as alternatives for medical treatment, personal hygiene and cleaning products, and aromatherapy. Various consumer products contain lavender and tea tree oil, including some soaps, lotions, shampoos, hair-styling products, cologne, and laundry detergents. Male gynecomastia occurring before puberty is relatively rare, but a growing amount of cases have been reported to coincide with topical exposure to lavender and tea tree oil. 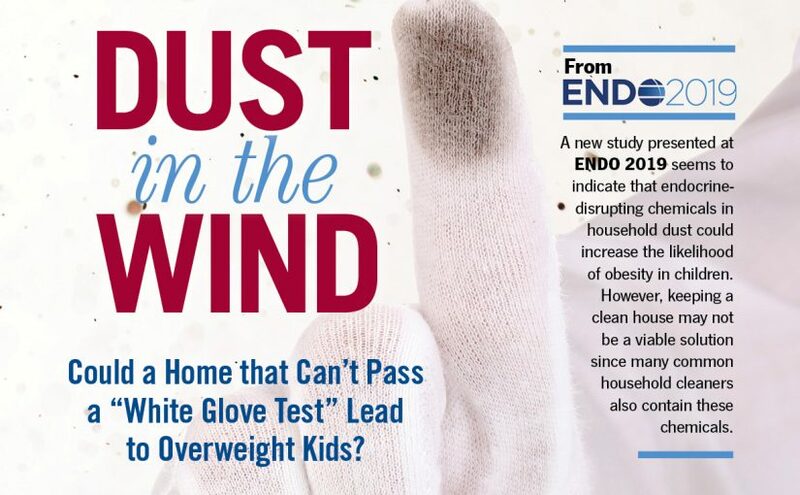 Kenneth Korach, PhD, the senior scientist for the new NIEHS EDC study, previously found laboratory evidence that lavender and tea tree oil showed endocrine-disrupting activities. “Our society deems essential oils as safe. However, they possess a diverse amount of chemicals and should be used with caution because some of these chemicals are potential endocrine disruptors.” — Tyler Ramsey, a postbaccalaureate research fellow at the National Institute of Environmental Health Sciences (NIEHS), part of the National Institutes of Health, Research Triangle Park, N.C.
Four of the tested chemicals appear in both lavender and tea tree oils: eucalyptol, 4-terpineol, dipentene/limonene, and alpha-terpineol. The others were in either oil: linalyl acetate, linalool, alpha-terpinene and gamma-terpinene. Using in vitro experiments, the researchers applied these chemicals to human cancer cells to measure changes of estrogen receptor- and androgen receptor-target genes and transcriptional activity. All eight chemicals demonstrated varying estrogenic and/or anti-androgenic properties, with some showing high or little to no activity, the investigators reported. Ramsey says these changes were consistent with endogenous, or bodily, hormonal conditions that stimulate gynecomastia in prepubescent boys. Indeed, the Research Institute of Fragrance Materials in 2013 published a paper in the International Journal of Toxicology that disputed Korach and his team’s 2007 findings. However, other studies have confirmed that the oils had hormonal activity. Ramsey and Korach acknowledge that what was presented at ENDO and the subsequent publication isn’t the final word on the health effects of essential oils. Their work warrants further investigation, and there are more questions to answer. Many of the chemicals Ramsey, Korach, and their team tested appear in at least 62 other essential oils. Another cause for concern is that essential oils are available without a prescription and are not regulated by the U.S. Food and Drug Administration. The public should be aware of these findings and consider all evidence before deciding to use essential oils. Bagley is the senior editor of Endocrine News. He wrote about how telehealth improved diabetes outcomes in VA patients in the May issue.